A Letter to Three Wives is a 1949 American romantic drama film which tells the story of a woman who mails a letter to three women, telling them she has left town with the husband of one of them. It stars Jeanne Crain, Linda Darnell, Ann Sothern, Paul Douglas in his film debut, Kirk Douglas, Jeffrey Lynn, and Thelma Ritter. An uncredited Celeste Holm provides the voice of Addie Ross, the unseen woman who wrote the titular letter. The film was adapted by Vera Caspary and Joseph L. Mankiewicz from A Letter to Five Wives, a 1945 novel by John Klempner, which had appeared in Cosmopolitan. It was directed by Mankiewicz, who directed All About Eve the following year. The film won two Academy Awards for Best Director and Best Writing, Screenplay and was nominated for Best Picture. Deborah grew up on a farm. Her first experience with the outside world came when she joined the Navy WAVES during World War II, where she met her future husband, upper-class Brad (Jeffrey Lynn). When they return to civilian life, Deborah is ill at ease in Brad's social circle. Adding to her insecurity, she learns that everyone expected Brad to marry Addie, whom all three husbands consider practically a goddess. However, she is comforted by Brad's friend Rita, a career woman who writes stories for sappy radio soap operas. Her husband George (Kirk Douglas), a schoolteacher, feels somewhat emasculated since she earns much more money. He is also disappointed that his wife constantly gives in to the demands of her boss, Mrs. Manleigh (Florence Bates). Rita's flashback is to a dinner party she gave for Mrs. Manleigh. She forgot that her husband's birthday was that night, and only remembered when a birthday present, a rare Brahms recording, arrived from Addie Ross. Lora Mae grew up poor, not just on the "wrong side of the tracks," but literally next to the railroad tracks. (Passing trains shake the family home periodically.) She sets her sights on her older, divorced employer, Porter (Paul Douglas), the wealthy owner of a statewide chain of department stores. Her mother, Ruby Finney (Connie Gilchrist), is unsure what to think of her daughter's ambition, but Ruby's friend (and the Phipps's servant) Sadie (an uncredited Thelma Ritter) approves. Matters come to a head when she sees a picture of Addie Ross on the piano in his home. She tells him she wants her picture on a piano: her own piano in her own home. He tells her he isn't interested in marriage, and she breaks off their romance. However, he loves her too much, and finally gives in and proposes (albeit unromantically), skipping a New Year's party at Addie's house to do so. When the women return from the picnic, Rita is overjoyed to find her husband at home. They work out their issues; she promises to not let herself be pushed around by Mrs. Manleigh. Deborah's houseman gives her a message stating that Brad will not be coming home that night. A heartbroken Deborah goes alone to the dance with the other two couples. When Porter complains about his wife dancing with another man, Deborah tells him he has no idea how much Lora Mae really loves him, but Porter is certain Lora Mae only sees him as a "cash register." Unable to take it anymore, Deborah gets up to leave, announcing that Brad has run off with Addie. Porter stops her, confessing it was he who started to run away with Addie, but then explains, "A man can change his mind, can't he?" Porter then tells Lora Mae that, with his admission in front of witnesses, she can divorce him and get what she wants. To his shock, Lora Mae claims she did not hear a word he said. He asks her to dance. The voice of Addie Ross bids all a good night. In the film, she is shown only once and from behind. Klempner's novel was A Letter to Five Wives. Two wives were lost in the transition to the screen. At one point, the film was called A Letter to Four Wives. When submitting the adapted screenplay to 20th Century-Fox chief Darryl F. Zanuck, Joseph L. Mankiewicz mentioned that he found it too long and asked how Zanuck felt about shortening the movie. "Take out one of the wives," Zanuck replied. Originally, the movie would have featured Anne Baxter as Martha. Zanuck did not feel Baxter's segment was as strong as the other three, so it was cut. All the major characters differ substantially between the novel and film, and the nature of the problems with their marriages also. In the novel, Lora May (not Lora Mae) is less a gold digger than a woman who has always been dominated by her wealthy husband; Rita is trying to succeed in a second marriage with a man she has never felt passionate about; and Deborah is a plain and quiet ex-spinster whose "catch" of a husband has been disappointed in her lack of success in society. As for the other two wives, Martha and her husband locked horns over child-rearing issues, while Geraldine was devoting excessive time and money to her singing career with few results. The novel also gives no indication that any of the couples will work through their problems (the film, ambiguities notwithstanding, has a decidedly happy ending), and the identity of the errant husband is different (though not his rationale). 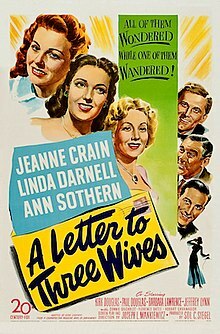 Film rights to John Klempner's A Letter to Five Wives were acquired by 20th Century Fox in February 1946, seven months after it was first published in a magazine. Melville Baker and Dorothy Bennett wrote the first treatments of the script. Even though he was not credited for the final film, it was Baker who had the idea that the character Addie was only to be heard, and not seen. In October 1946, F. Hugh Herbert was assigned to write the screen adaptation. His final participation was not confirmed. In the same month, it was announced that Samuel G. Engel took over as producer from Joseph L. Mankiewicz. Even before a script was finished, Gene Tierney, Linda Darnell, Maureen O'Hara, Dorothy McGuire, and Alice Faye were cast in A Letter to Five Wives in November 1946. For a while, the project was shelved until Mankiewicz returned, working on drafts of the script between March and late April 1948. Around this time, Sol C. Siegel was assigned to replace Engel as the film's producer. Vera Caspary adapted the story to A Letter to Four Wives. Then studio head Darryl F. Zanuck and Mankiewicz eventually decided in mid-1948 to focus on only three marriages, thus retitling it to A Letter to Three Wives. :84 In June 1948, it was on the top of 20th Century Fox' list of films to be produced over the following ten months. In addition to the actresses already named as cast members, Anne Baxter and Tyrone Power were also at one point cast. Furthermore, Joan Crawford and Ida Lupino were considered for the (eventually offscreen) role of Addie. When Baxter was cast, in April 1948, the film was still known under its working title A Letter to Four Wives. She was cast a day after Jeanne Crain, who signed on for the role after months of rumors of her participation. By May 1948, Baxter, Crain, Darnell, and Sothern were the four actresses to portray the title roles, and Macdonald Carey campaigned for a secondary role. In 1985, the film was remade into a television movie of the same name starring Loni Anderson as Lora Mae, Michele Lee as Rita, Stephanie Zimbalist as Debra, Charles Frank as Brad, Michael Gross as George and Ben Gazzara as Porter. Ann Sothern also appeared as Ma Finney. In 2010, The Simpsons made their own version of the story, in an episode called "Moe Letter Blues". ^ Hutchens, John K. (February 24, 1946). "People Who Read and Write; New House". The New York Times. Retrieved 2010-08-23. ^ a b c d e f g h i "Notes for A Letter to Three Wives (1949)". Turner Classic Movies. Retrieved 2010-08-23. ^ "PARAMOUNT NAMES LAKE, LADD TO FILM; Studio Will Co-Star Team in 'Saigon,' Adventure Story-- Fenton to Be Director". The New York Times. October 29, 1946. Retrieved 2010-08-23. ^ Lower, Cheryl Bray; Palmer, R. Barton (2001). Joseph L. Mankiewicz: critical essays with an annotated bibliography and a filmography. McFarland & Company. Wikimedia Commons has media related to A Letter to Three Wives (film).